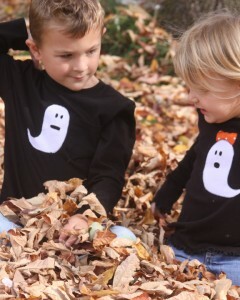 It’s no doubt that kids LOVE holiday shirts! 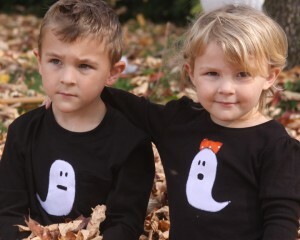 My kids busted out the Halloween shirts before October even started this year. I made these matching brother and sister ghost shirts for just a few bucks to help the kids celebrate in style. These shirts turned out so cute. 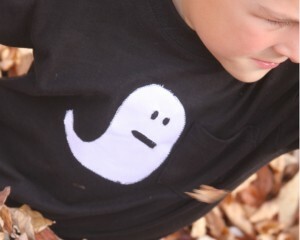 I spotted a simple ghost appliqued shirt on etsy and put my own spin on it. I wanted the ghosts to be facing opposite directions, have different mouths, and be gender specific. I used the good old $3.88 Cranimal shirts from Walmart to make these. I had the heat n’ bond and fabric for the ghosts at home. You need very little white and orange fabric to make these. Go to my tutorial on how to applique t-shirts for a step by step tutorial. 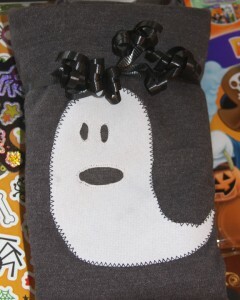 For the girl ghost I made a little bit rounder mouth and added a bow on top! 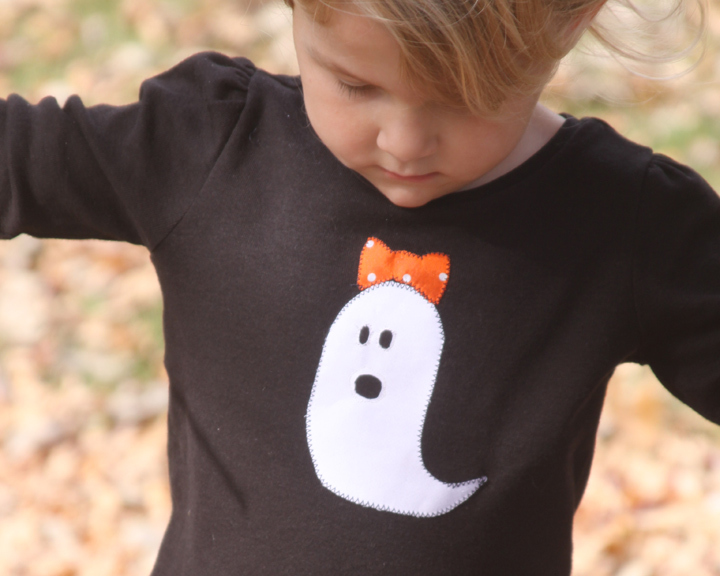 I used an orange fabric with white polka dots to make an adorably spooky bow. For my son’s shirt I made the mouth a bit longer and skinnier. I did a zig zag stitch around the outside of the ghosts using black thread. I used white thread around the eyes and mouth and used a straight stitch. The eyes and mouth were so small that a zig zag stitch just wouldn’t work. The straight stitch is on top the white fabric so you don’t really see it at all. How will I convince them that it is time to put these away once Halloween is over? Simple and adorable for about $5.00 each! They adore there new shirts and I adore them in them. You could easily make these for the whole family or just all the siblings! What kid wouldn’t love to get these as a gift at a Halloween party too? We even made one one of my son’s friends at school. We were invited to his birthday party – but I didn’t really know what he was interested in. What better gift than a Halloween shirt and some fun Halloween crafts and books just in time for the holiday. Cross your fingers that his family isn’t anti-Halloween! This ghost is appliqued onto a dark grey turtleneck, and looks pretty cute. These shirts are so cute!! I totally want to make some for my two kids!! Love the bow you put on yours! Cute shirts for cute kids… great job!